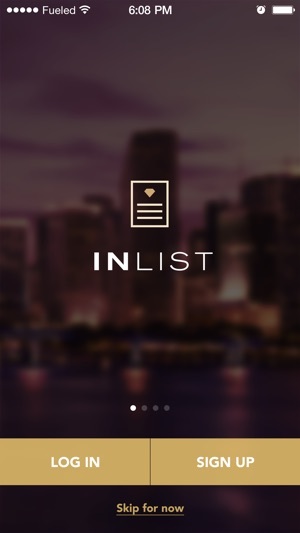 InList is a revolutionary mobile app for discovering and booking nightlife, upscale restaurant parties, concerts & once-in-a-lifetime experiences. InList provides VIP access to a curated list of the hottest events in 45 jet-set cities including Miami, NYC, Los Angeles, London, Paris, Hong Kong, Singapore, Ibiza, Dubai and many more. Our VIP members receive upgraded table locations, points redeemable towards future purchases, and invites to exclusive star-studded parties around the globe. 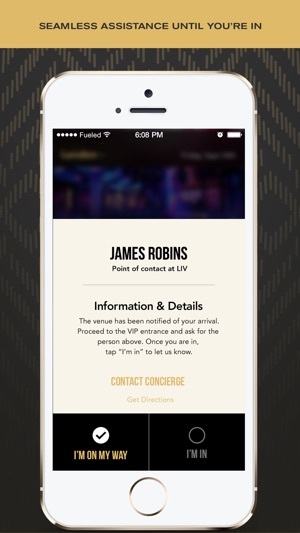 InList makes sure your experience is both smooth and high quality, no matter what nightlife capital you touch down in. 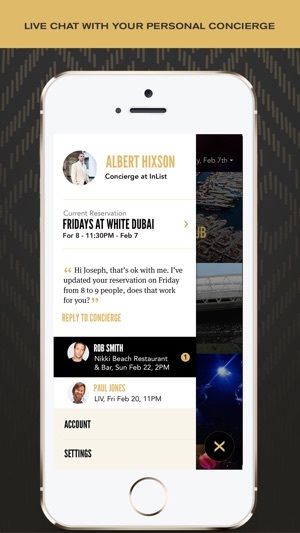 InList makes booking nightlife and special events easier than ever. 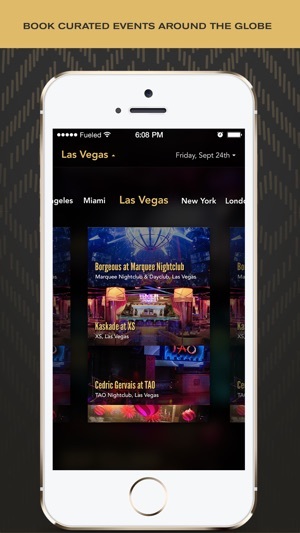 The app grants you reservations when you want them, with a nightlife expert in the palm of your hand. It’s like being treated as a local VIP 24/7 in the most exciting destinations in the world. Purchase tickets to concerts, sporting events and film festivals such as Wimbledon and the Super Bowl to the Cannes International Film Festival and MTV Video Music Awards. The InList experience is smooth and seamless, due to the combined expertise of co-founders Michael Capponi (a 25-year nightlife expert) and Gideon Kimbrell (software engineer for Fortune 100 companies). InList’s advisory board and global ambassadors are equally connected in the nightlife and tech worlds and oversee each and every reservation ensuring seamless assistance until you're in. With this team, you can be assured that your reservation is being handled by real insiders—not some geeks in a remote office. Meaning your entrée into the most happening events on an international scale is assured. 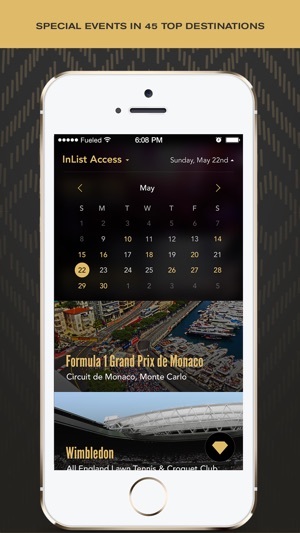 With InList, you’ll arrive in style and with confidence at the greatest parties and events in the world. Living in a city where nightlife dominates , we're used to a very particular treatment and high expectations . We recently travelled to Europe in the summer , and didn't want our experience there to be any different. By word of mouth we were referred to this app. It was a life saver ! It was our first time to ibiza & St Tropez and we didn't want to lose out on any of the major events going on . It's easy to use and what I liked most is that they have done the best research to find the best venues . When we mentioned the app upon arriving to these venues , we were treated like royalty. They've obviously done a great job in creating close ties with these venues . The type of service you can't get just by calling a place and requesting a table . Can't wait to use it in our next trip to London & Dubai ! App has superb design and functionality, as well as great transparency into upcoming events in my area (Palm Beach//Miami). Haven't used concierge yet but looking forward to trying it on an upcoming trip to the French Riviera where I know less about the local scene. Comments such as Danny Ocean review demonstrate a lack of understanding where the world is going- by his logic why use opentable when you can call a restaurant. This is a seamless and innovative solution to create credibility and remove painpoints for the venue and consumer alike, not to mention the plethora of product extensions that can and likely will be added to InList going forward. Great app and excited to use it regularly. This app has been amazing since the first day I started using it. All I have to do is open the app to see what events are going on around me. When I take trips out of Miami to New York, Vegas, and L.A., where I don't know as many people, its been a great way to get an awesome table reservation with no hassle. I also love that I feel so important to them.. actually like a VIP. Their concierge service is absolutely amazing and they are so helpful whenever I need them. I recommend this app for anyone that likes to go out and feel EXCLUSIVE and have luxury service at all times!! A++++! !